Of Dice and Men is essentially three-books-in-one. 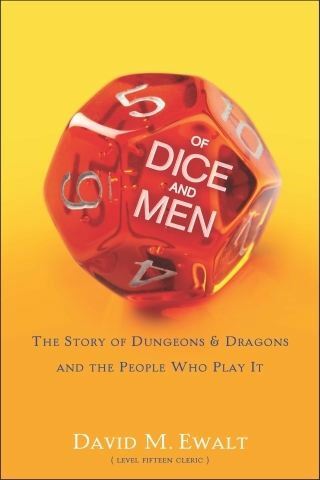 It is a history of the role playing game hobby, with a spotlight on early days of Dungeons & Dragons. It is an investigative report on the gamer community. And finally, it is the fascinating journey of one man’s return to the hobby. And while all three tasks are performed adequately and even entertainingly, none are particularly handled with a great degree of depth. Like the similar Fantasy Freaks and Gaming Geeks (by Ethan Gilsdorf), I was left essentially unsatisfied, only because I felt that the book merely scratched the surface of the hobby that I love. After finishing the book, I found that, ultimately, I wanted more. More of the history of “The World’s Most Popular Roleplaying Game”, more stories from the author’s own gaming group’s campaign, and more stories from the gaming community at large. Given particularly short shrift was the increasing role of women in the gaming hobby. I would have like to seen this addressed with perhaps a discussion as to why there have traditionally been fewer female gamers and how (and why) that’s changing. Further, while the historical sections have many interesting anecdotes about the Apple-like history of TSR and D&D’s co-creators, the author seemed to only hit some of the high points of that history. For instance, the controversial reign of manager Lorraine Dille Williams received only about five pages of coverage (and a note to see more on the website). Make no mistake–this book is extensively researched but it seems like more information, more of the story, could have made it onto the page. I also wanted to hear more about the author’s own reawakening as a gamer and the fascinating campaign that he and his group play in. The asides that he presents “in-character”, and the way in which his character’s journey parallels his own, was a brilliant conceit. The stories that are presented are done well. Ewalt is a good writer and shows obvious love for the hobby and its history. The book is a quick, highly informative, and entertaining read. I just wish there was more of it.